Why I'm for minimum wage increase. First let me say that for a few months I had to take on a part time job when I had fallen on hard times, so I guess I'm speaking for experience on this post. While I knew my situation was temporary I could not help but to think of those who didn't have another outlet, those for whatever reason were not able to "advance" in life. Working a job were you are paid next to nothing with hours that makes you feel like a job you dislike has consumed your life, is not only physically draining but also mentally. We complain about the lack of customer service we receive this day and age but what do people really have to work for? Why should they offer their best when we are saying "you don't deserve better and we think less of you?". I also see people complaining about those who receive government assistance but in all reality many are working a minimum wage job with children plus and food and other experiences. What is wrong with wanting to see our fellow neighbor do better or have a chance to TRY and get on their feet? We don't know everyone's situation or why they ended up were they are but should we deny them simply because they work a job we deemed unworthy? Ask yourself how many times do you visit a place of business with people working for minimum wage? Maybe $15 is too much but minimum wage should be raised, also keep in mind we have more senior citizens back in those minimum wage positions. I'm sorry but it breaks my heart to see someone who should be enjoying their retirement but still working because they cost of living has gone up so much. 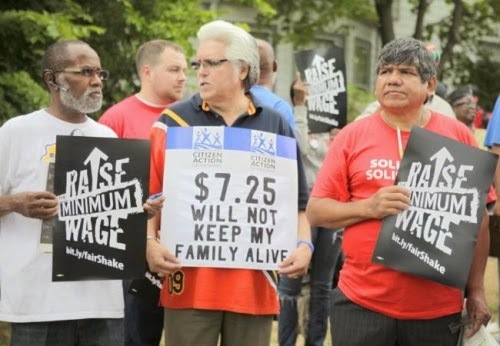 Really what harm will raising minimum wage do to us? Personally ask yourself who are you to deem someone unworthy? Someone you've never met, formed an opinion about a job you've never performed. Sometimes its about thinking from another perspective than our own. I will say I have gained a lot more respect for the "working class", I've simply gained more respect for my fellow sister and brother.